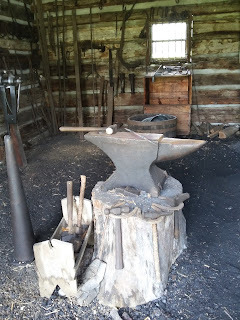 A little while ago, I started blogging about my trip to the Shenandoah Valley to walk in the footsteps of my 3-times-great-grandfather, who was a blacksmith in the 14th Pennsylvania Cavalry and whose unit was up and down the Valley during the Valley campaign of 1864. 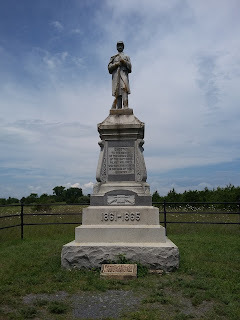 On Day 1, I visited Grand Caverns and met up with my dad to roam over the ground where the Battle of Piedmont took place. Day 2 saw us waking up in Harrisonburg. Our itinerary for the day: New Market, Fisher's Hill, and Cedar Creek, all of which have actual preserved battlefields to visit (unlike for the Battle of Piedmont). The 14th Pennsylvania (or detachments thereof) took place in all three battles. As Civil War battles go, the Battle of New Market was a relatively small affair. About 10,000 troops took part in the battle, with about 1,400 casualties. Compare that to 50,000 casualties at Gettysburg. General Grant. Grant wanted to disrupt the resources that Lee was funneling to his army from the Valley, and to force Lee to move some of his troops to the Valley to deal with the threat. Franz Sigel was in overall command in the Valley when the armies clashed at New Market on May 15, 1864. Spoiler alert: it didn't end well for Sigel, who ended up retreating back into Maryland and being replaced by David Hunter (he was in command during the Battle if Piedmont, the site we'd visited the day before). 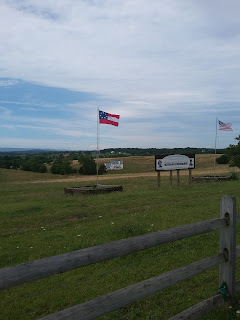 Like the other battlefields we visited, the New Market battlefield was right along I-81 and Route 11 (the old Valley Turnpike). In this part of the world, getting off the highway plops you pretty quickly into the middle of fields and narrow, two-lane roads. Hopping off the highway, we crossed back under highway, turned right immediately, and were at the battlefield. the rifles and early machine guns on display; I liked the uniforms--and the helpful dioramas and tableaux. We were also directed to a video presented in a little theater (on something of a continuous loop). It told the story of the Virginia Military Academy (VMI) cadets who fought at the Battle of New Market, ten of whom died. There was such a focus on these young men that I started to wonder whether anyone else took part in the battle. I guess it's one of the most attention-grabbing stories of the battle: a whole corp of boys from VMI come marching up to New Market to defend Virginia, and they fight (and die) bravely. Plus . . . well, this is Virginia, so there's a natural tendency to focus on the Virginia boys, above and beyond the Southern habit of subtly (or not-so-subtly) romanticizing the Confederates. hopped on our bikes. It was a lovely morning as we cruised across the grass towards the old Bushong Farm, a white woodframe building with a clutch of outbuildings around it. We paused to read the signs telling us that the Confederates were arrayed roughly in a line from our left to our right, the Yankees in front of us in an opposing line. We took a bit of a walk to the canons set out on the open ground, while meanwhile a farmer was baling hay nearby. The smell of cut grass warmed in by a thick yellow sunlight mingled with the buzz of insects and the faint hum of a highway that seemed a million miles away. To the east was the all-too-evident Massanuten mountain and the gap through it: New Market Gap. It was a pretty spectacular view. then were pushed back north as the army retreated. But they were there. Right there. In that spot, where there's a body shop now. But so many other things are just as they were: the mountains, the fields . . .
Having ridden all over the battlefield (well, over some of it), we rode back to our vehicles, packed up our bikes, and went into town for lunch at The Southern Kitchen. It was delicious, by the way: we got some fantastic fried chicken. If the battle of New Market was "minor", the Battle of Fisher's Hill was more so, in some ways. The battle took place just two days after the Third Battle of Winchester (which I will talk about in another blog post). 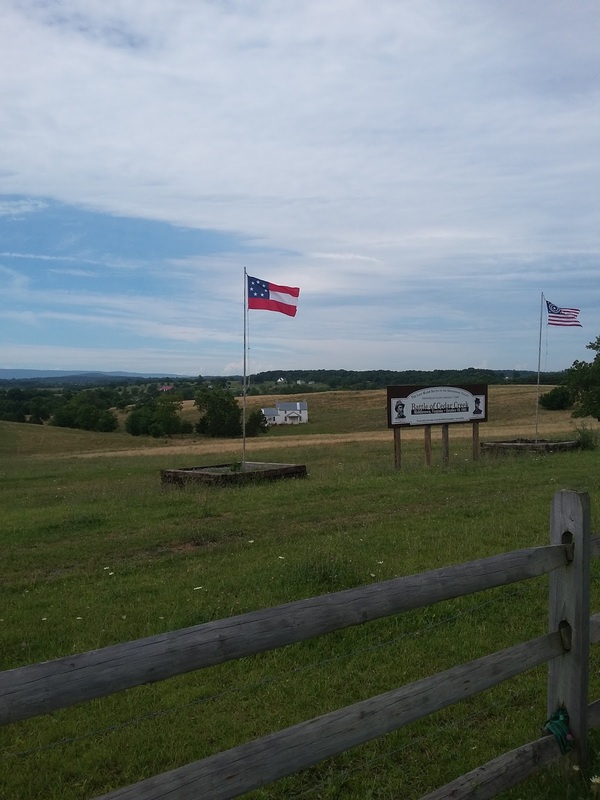 The Confederates had been defeated there and retreated to Fisher's Hill, which is actually a series of hills that stretches across the Valley not far from Winchester. The Confederates thought to take a stand here. They considered it an impregnable stronghold. But they were flanked and routed, and sent scurrying south again. 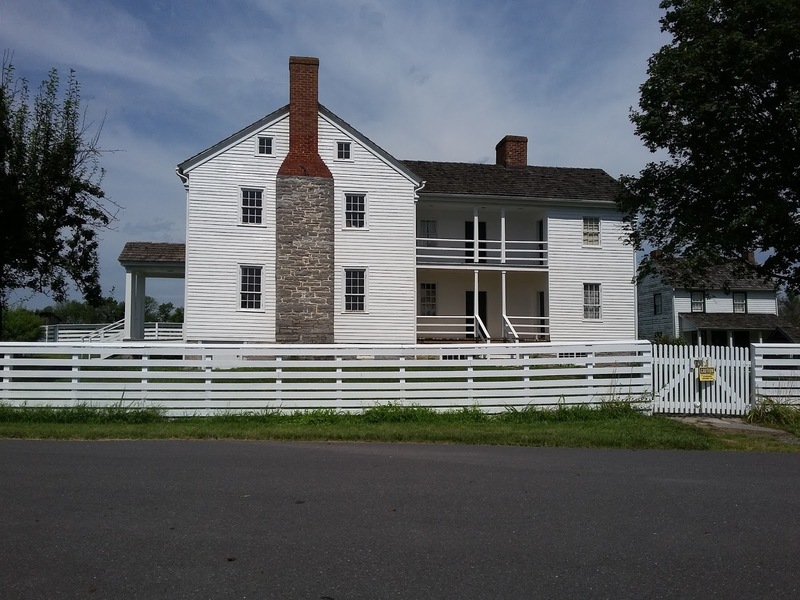 Instead of taking the Interstate from New Market to Fisher's Hill, we took old Route 11 through the string of towns between the two battlefields (they aren't far apart--maybe 30 miles). The downtowns are quaint, with the old buildings still clustering close together and close to the street. As we passed through, the sunny day began to grow cloudier. By the time we got there--down a tiny one-and-a-half-lane road that twisted past a mill and some old barns--it was looking downright stormy. We got out of our vehicles long enough to glance at the explanatory sign before big raindrops began to plop all around us. We hopped into my dad's truck, and the deluge broke loose. We sat there looking over the battle map as the rain came down steady on the windshield. Lucky for us, the rain passed fairly quickly. It was still a bit drippy as we got out and started walking. This is an underdeveloped park. They have a nice parking area with an informative sign telling about the battle, the campaign, and some of the people involved in the battle. 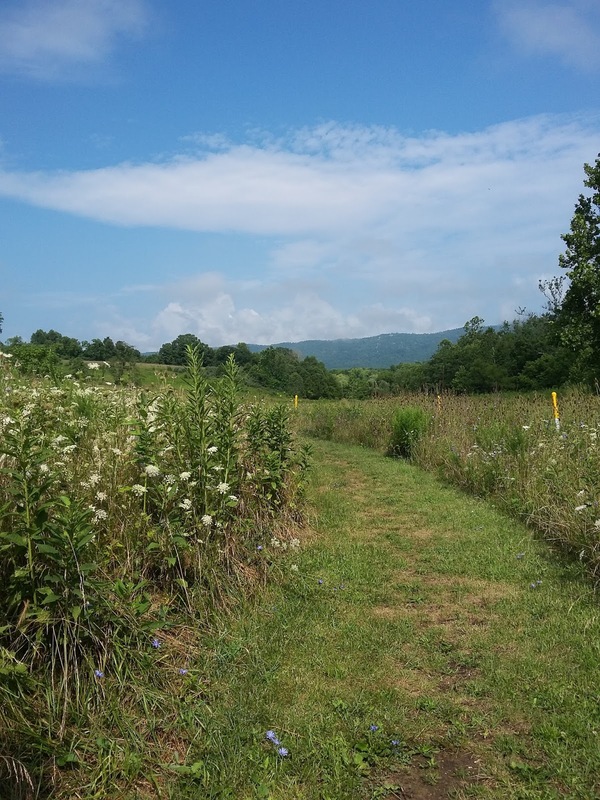 The big problem is that, though there are miles of paths mowed into the grassy hills that comprise the park, there's no map or indication of where the paths take you. There's no sort of orientation until you're up on the hill, looking at the signs along the path. Even then, the signs orient you to that spot; there are words and maps to help you imagine the action, but they don't show you where you are within the park. I say this because it was a pleasant, if damp, walk, up the hill, but after tramping through the grass for about a mile, we stopped, because we weren't sure what lay ahead of us (there might have been wonderful things, but it also might have been two more miles of wet grass), and as we walked back we took a left instead of a right and ended up at a dead end. We had to backtrack. Better signage would have been appreciated! The park lies south of Battlefield Road and cuts across where the Confederate lines were positioned. The Confederates stretched across where I-81 now lies, and off to the west, towards Little North Mountain. The line didn't stretch all the way to the mountain, though. It was "hanging", meaning it wasn't anchored on any particular geographical feature. (The Confederate army was so depleted after Third Winchester that they couldn't stretch their men that far.) That's why the Union forces were able to swing around that side of the line and surprise the Confederates. 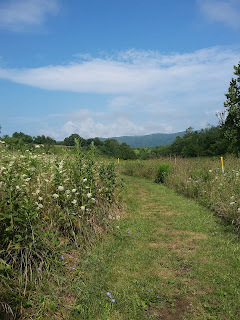 To the west, on Back Road, was where the 14th PA Cavalry saw action. My handy-dandy battle map showed me that the 14th was slightly north of the rest of the Union line. Like in previous places we visited, they swept down the rode during the battle, from north to south, on the right flank of the Union Army. 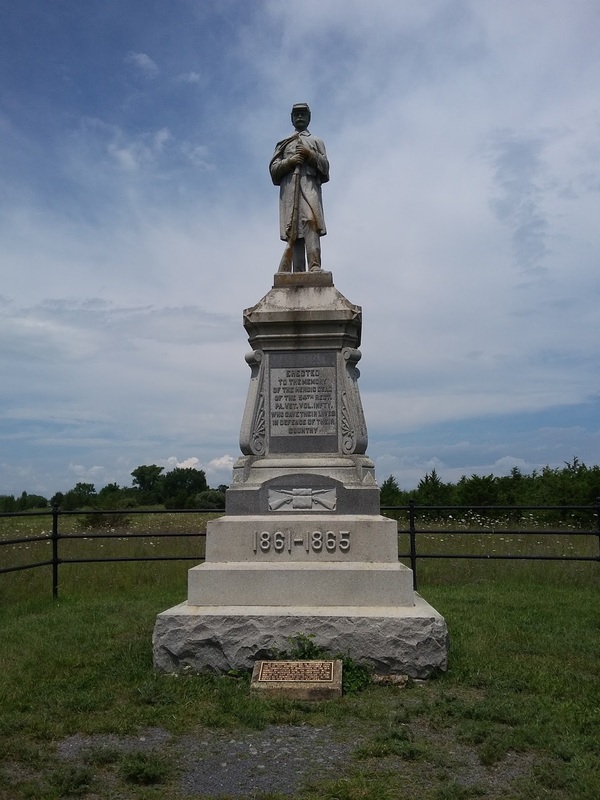 It was on this side of the battlefield that the infantry came swooping down on the Confederate flank--so even if the cavalry hung back for that, they certainly would have witnessed it. The Confederates were beaten at Fisher's Hill, but it wasn't the end of them by any means. A month later, in October, the Confederates regrouped and moved north. There was a battle at Cedar Creek, very near Winchester. 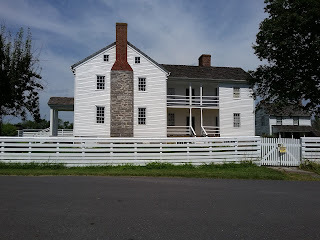 Here at Cedar Creek, it looked like the numerically inferior Confederates might send the Federals flying back to Maryland (or further) again, but just as things got hairy, General Philip Sheridan, who had commanded at Third Winchester and Fisher's Hill, came racing back from Washington, where he'd been conferring with General Grant. He arrived in the nick of time, rallying his troops and winning the battle. It was a death knell for the depleted Confederate forces, which couldn't afford the casualties. This was basically the end of the Confederates in the Valley. That meant that Washington DC was no longer in danger from Confederate forces using the Shenandoah as a "back door", and that Lee would have a lot resources on hand while he was besieged in Petersburg. 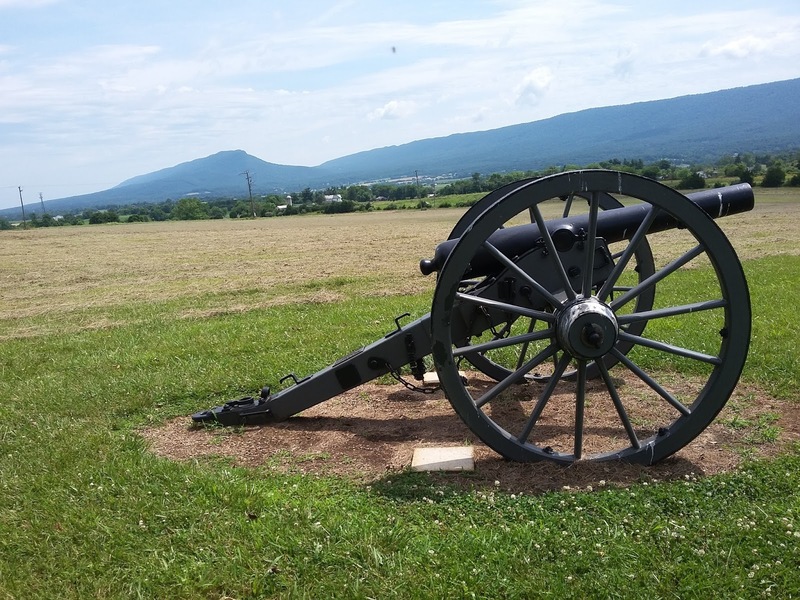 Being one of the most important battles in the Shenandoah theater of the Civil War, a large portion of the field has been preserved as a park (there's also a plantation with the park). Maybe because it isn't signed well, maybe because it was still raining, maybe because I was tired, and maybe because I'm just an idiot, I--strangely--had a lot of difficulty actually finding the damn place. I blame my GPS, which took me to a trucking facility instead of a battlefield . . . I got flustered, and I ended up turning around three times. My poor dad was following in his truck, and he was probably more confused than I was. Thank God I have a patient, loving dad who didn't get flustered at all and calmed me down. After we regrouped, we finally found the place and took a quick driving tour. I think I was looking for more than was there (I was looking for a central visitor's center or pull-off spots or something), and so I didn't really stop anywhere. Finally, we ended up back to the main road, and that was our tour of Cedar Creek! It was all very wet, and it didn't look like there was a great deal of interpretation (signs and whatnot) to look at, so it was probably best to just roll through in our cars anyway. And so our adventure on Day 2 came to an end. We drove the short distance to our hotel in Winchester, had dinner in a restaurant across the block, showered, and went to bed. Happy Birthday, National Park Service!